Can My DUI Be Dismissed if I Was Not Read My Miranda Rights? Let’s handle this Q&A style. Can I ask a judge to dismiss my drunk or drugged driving charge just because the officer who arrested me did not read me my Miranda rights? But receiving a Miranda warning matters, right? Yes. But only in a limited way, and only in terms of things you tell a law enforcement official. In what way does hearing or not hearing my Miranda rights matter? While the rights spelled out in the Miranda warning exist at all times, a police officer is only required to remind you of them after he or she takes you into custody for suspected driving under the influence. In the course of a stop for suspicion of the offense Ohio calls operating a vehicle while intoxicated (OVI), a lot happens before the suspects is placed in custody. What can happen before an arrest for driving under the influence that is not subject to a Miranda warning? Everything. Your appearance, the items visible through the windows of your vehicle, and your performance on field sobriety tests and/or chemical tests for alcohol and drugs are never subject to the protections afforded by the Miranda warning. Other protections for your right to avoid self-incrimination apply, but not the requirement for Miranda warnings. For instance, you can say no when asked to take part in field sobriety tests. Also, anything a DUI/OVI suspect says to a police officer who approaches the car or conducts field sobriety tests can be used as evidence during a trial. This is why experienced Columbus, Ohio, driving under the influence defense attorneys will caution people who ask what they should do if they might get targeted for drunk or drugged driving enforcement to speak as little as possible during traffic stops and at DUI checkpoints. So, how can it help me to show that no one read me a Miranda warning? Police officers will continue asking you questions and listening to what you say to other people after they place you under arrest. 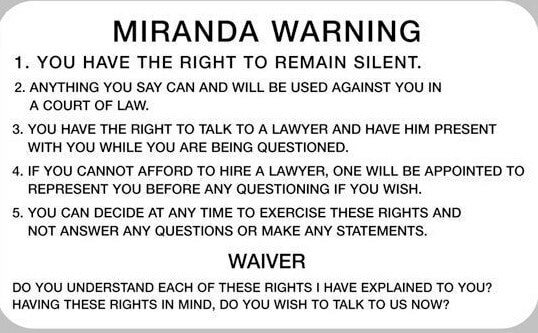 None of this will be admissible as evidence unless they read the Miranda warning. What happens if things I told police or said in their presence are ruled inadmissible? Your driving under the influence attorney will have a much better chance at arguing for a dismissal of your DUI/OVI charges due to lack of evidence. What are some other grounds for seeking a dismissal of OVI charges in Ohio? Officers must have reasonable suspicion for stopping a driver. Field sobriety and laboratory tests must be carried out according to strict rules. All physical evidence like blood samples must be kept secure. All video of interactions between police and the suspect should match what law enforcement officials and prosecutors say happened. Learn how a Columbus, Ohio driving under influence attorney can help you by requesting a no-cost case consultation from The Maher Law Firm. Reach us online or call (614) 205-2208.